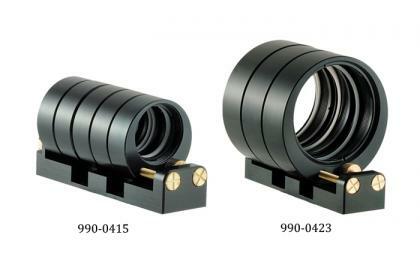 The holder of 1 inch filters 990-0415 allows fixation of up to 5 filters into 1 inch optics ring holders. The thickness of optical filters (or any other optical elements) to be held is from 0.5 mm to 8.0 mm. Filters can be easily replaced in ring holders. This filter holder allows fast filter removal from beam path flipping it at 90° position. Any position of filters can be fixed with a fixing screw. The firm 0° position can be fixed with the second brass screw (included). The holder of 2 inch filters 990-0423 allows fixation of up to 3 filters into 2 inch optics ring holders. The thickness of optical filters (or any other optical elements) to be held is from 0.5 mm to 14.0 mm. The holder 990-0415ND is the same holder 990-0415 but with Neutral Density filters that operates as step energy attenuator and allows adjusting transmission from 100% (all 5 filters are at 90° position) till 0.015% (all 5 filters are at 0° position) at visible region. If you need other adjustment you can choose any other Neutral Density filter Ø25.4 mm. Using the holder 990-0415 with various color glass or dielectric filters various transmitted band pass regions can be achieved. The Filters Holder with 90° Flip is made of black anodized aluminium and brass screws.